Urban forestry is the careful care and management of urban forests, i.e., tree populations in urban settings for the purpose of improving the urban environment. Urban forestry advocates the role of trees as a critical part of the urban infrastructure. Urban foresters plant and maintain trees, support appropriate tree and forest preservation, conduct research and promote the many benefits trees provide. Urban forestry is practiced by municipal and commercial arborists, municipal and utility foresters, environmental policymakers, city planners, consultants, educators, researchers and community activists. Management goals should be based on an understanding of public attitudes, perceptions, and knowledge, a review of the agents in change, and the expressed needs and concerns of the community. These goals should be compared to a dynamic or temporal description of the resource based from inventory and management objectives (Mudrack 1980). Function, the dynamic operation of the forest, includes biochemical cycles, gas exchange, primary productivity, competition, succession, and regeneration. In urban environments, forest functions are frequently related to the human environment. Trees are usually selected, planted, trimmed, and nurtured by people, often with specific intentions, as when a tree is planted in a front yard to shade the driveway and frame the residence. The functional benefits provided by this tree depend on structural attributes, such as species and location, as well as management activities that influence its growth, crown dimensions, and health. Urban forest functions are thus often oriented toward human outcomes, such as shade, beauty, and privacy. People develop emotional attachments to trees that give them special status and value. Removing hazardous trees can be difficult when it means severing the connection between residents and the trees they love. For many, feelings of attachment to trees in cities influences feelings for preservation of trees in forests (McPherson. 1998). Having regular access to woodland is desirable for schools, and indeed Forest kindergartens take children to visit substantial forests every day, whatever the weather. When such children go to primary school, teachers observe a significant improvement in reading, writing, mathematics, social skills and many other areas. Urban forestry is a practical discipline, which includes tree planting, care, and protection, and the overall management of trees as a collective resource. The urban environment presents the arboricultural challenges of limited root and canopy space, poor soil quality, deficiency or excess of water and light, heat, pollution, mechanical and chemical damage to trees, and mitigation of tree-related hazards. Management challenges include maintaining a tree and planting site inventory, quantifying and maximizing the benefits of trees, minimizing costs, obtaining and maintaining public support and funding, and establishing laws and policies for trees on public and on private land. Urban forestry presents many social issues that require addressing to allow urban forestry to be seen by the many as an advantage rather than a curse on their environment. Social issues include under funding and lack of management. Tree warden laws in the New England states are important examples of some of theearliest and most far-sighted state urban forestry and forest conservation legislation. In1896, the Massachusetts legislature passed the first tree warden law, and the other fiveNew England states soon followed suit: Connecticut, Rhode Island, and NewHampshire in 1901, Vermont in 1904, and Maine in 1919. (Kinney 1972, Favretti 1982, Campanella 2003).As villages and towns grew in population and wealth, ornamentation of public, or common, spaces with shade trees also increased. However, the ornamentation of public areas did not evolve into a social movement until the late 18th century, when private individuals seriously promoted and sponsored public beautification with shade and ornamental trees (Favretti 1982, Lawrence1995). Almost a century later, around 1850, institutions and organization were founded to promote ornamentation through private means (Egleston 1878, Favretti 1982). In the 1890's, New England's “Nail” laws enabled towns to take definitive steps to distinguish which shade trees were public. Chapter 196 of the 1890 Massachusetts Acts and Resolves stated that a public shade tree was to be designated by driving a nail or spike, with the letter M plainly impressed on its head, into the relevant trunk. Connecticut passed a similar law in 1893, except its certified nails and spikes bore the letter C. (Northrup1887). 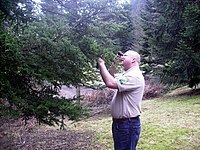 In the United States, federal urban forestry policy is overseen by the USDA Forest Service, part of the Department of Agriculture . Much of the work on the ground is performed by non-profits funded by private donations and government grants. Policy on urban forestry is less contentious and partisan than many other forestry issues, such as resource extraction in national forests. Resolving limitations will require coordinated efforts among cities, regions, and countries (Meza, 1992; Nilsson, 2000; Valencia, 2000). Loss of green space available growing space is limited in city centers. This problem is compounded by pressure to convert green space, parks, etc. into building sites (Glickman, 1999). Harsh growing conditions that makes tree survival an achievement. Lack of information on the tolerances of urban tree cultivars to environmental constraints. Too few communities have working tree inventories and very few have urban forest management plans. Lack of public awareness about the benefits of healthy urban forests. Poor tree care practices by citizens and untrained arborists. Nowak, D. (2000). Tree Species Selection, Design, and Management to Improve Air Quality Construction Technology. Annual meeting proceedings of the American Society of Landscape Architects (available online, pdf file). Nowak, D. The Effects of Urban Trees on Air Quality USDA Forest Service (available online, pdf file). Nowak, D. (1995). Trees Pollute? A "Tree Explains It All". Proceedings of the 7th National Urban Forest Conference (available online, pdf file). Nowak, D. (1993). Plant Chemical Emissions. Miniature Roseworld 10 (1) (available online, pdf file). Nowak, D. & Wheeler, J. Program Assistant, ICLEI. February 2006. McPherson, E.G. 1998. Structure and sustainability of Sacramento’s urban forest. Journal of Arboriculture 24(4):174–90. McPherson, E. G. & Simpson, J. R. (2000). Reducing Air Pollution *8Through Urban Forestry. Proceedings of the 48th meeting of California Pest Council (available online, pdf file). McPherson, E. G., Simpson, J. R. & Scott, K. (2002). Actualizing Microclimate and Air Quality Benefits with Parking Lot Shade Ordinances. Wetter und Leben 4: 98 (available online, pdf file). Hanson, Michael L.(1990). Urban & Community Forestry, a Guide for the Interior Western United States, USDA Forest Service, Intermountain Region, Ogden, Utah. Glickman, D. 1999. “Building Cities of Green”.1999 National Urban Forest of Conference. American Forests, Washington, DC. Pp. 4-7. Nillsson, K., Randrup, T.B., and Wandell, B.I.M. 2000. “Trees in the Environment”. Oxford University Press, New York, NY. Valencia, R.L. 2000. Management of Green Area in Mexico City. Presentation to the 20th Session of the North American Forestry Commission, June 6-10, St. Andrews, Canada. Mudrack, L. 1980. “Urban Vegetation: A Reference for New York Communities”. New York Department of Environmental Conservation. KINNEY, J.P. 1972. The development of forest law in America including legislation in America prior to March 4, 1789. Arno Press, New York. CAMPANELLA, T.J. 2003. Republic of shade: New England and the American elm. Yale UniversityPress, New Haven, CT.
EGLESTON, N.H. 1878. Villages and village life with hints for their improvement. Harper and A Brothers, Publishers, New York. SOLOTAROFF, W. 1911. Shade-trees in towns and cities. John Wiley & Sons, New York. NORTHRUP, B.G. 1887. Arbor Day: Its history and aims, and how to secure them. Rep. Sec. Connecticut Board of Agric. 13 p.